If one takes responsibility for an outcome away from the individual involved in performing an action, what happens? Or to frame this using an example, if one exhorts an individual to achieve a particular target, but places all responsibility and consequence for the failure to achieve that target on the shoulders of somebody else, is this more or less likely to mould an individual committed to achieving the set target? And, equally as importantly, what reaction is it likely to produce amongst those upon whom responsibility for failure shall ultimately be placed? 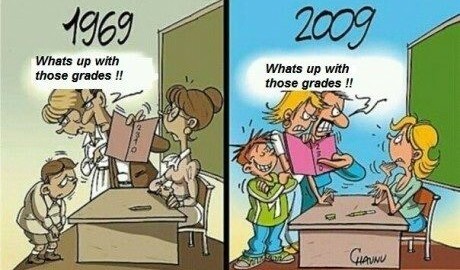 So the same with teaching. When primary responsibility for success or failure is taken away from the student and placed instead on the shoulders of teachers, what effect might this have on the education system? Is it beneficial for moulding well-educated and well-balanced young individuals, or not? Is it a recipe for high-standards and an academically rigorous system, or not? Is it a way to achieve confidence in the exams system as giving a true representation of capability, or not? This strikes me as an important question, particularly in light of recent drip drip revelations about the lengths which teachers and schools more generally are willing to go to achieve student success, even when it might stray into the realms of the ethically dubious. Or to phrase it in the slightly more hysterical (though possibly more accurate) words of some: with cases of teacher ‘cheating’ appearing on the radar more and more often, might it not be worthwhile questioning why this might be so? As a tentative first response, one might simply respond: when the stakes are highest for teachers, sometimes they crack. Michael Gove, in this sense, is a fully signed up member of the ‘All Must Have Prizes’ club. This sounds curious, since he has recently gone on record acknowledging that re-instilling academic integrity to the exams system will come at the cost of more children failing to achieve the exam grades they might currently expect to receive. The important bit, however, is what comes next – that Headmasters and teachers will inevitably lose their jobs in light of this. Which is understandable when the issue is clear-cut enough as ‘your pedagogy is bonkers and this is leading to widespread failure,’ though not so much when it merely articulates the complete removal of responsibility from students themselves. Cue gasps and shock from an astonished crowd, who expect (quite rightly) that teachers are there to educate and should be held to account where they fail to do so. On which I agree. But that need not come at the price of holding teachers solely responsible for failure (nor, indeed, for success). This is not an either/or settlement. Which is where Gove gets it wrong, on both education and ethics. For him, all students must progress to achieve their potential (as determined by the DATA), and their failure to do so can only be the result of poor teaching and/or poor school management. Children, it would seem, are predictable agents for whom the consistent, high-quality application of x will always produce the predicted outcome of y. Should that outcome fail to materialise then the process must be the problem; or rather, those responsible for input must be at fault. As such, failure and failing has been banished from the classroom – it can only exist in the staffroom. The wheels of this manifestly fictional ruse are greased with an emotive barrage of unanswerable rhetoric, typically summed up with questions like ‘would you accept this for your children? !’ as if the vast majority of teachers, who break their bodies and often their hearts trying to do all they can to help other peoples’ children succeed, want anything less than the very best for those under their tutelage. What can be done? Well, we shout, punish, cajole, encourage, inspire, even bribe. We deliver sermons from on high about how this should not be so. We endlessly reflect and reach out, trying everything in our power to bring back into the educational fold those who remain doggedly determined to resist our overtures. But the reality is that the targets of our efforts do not always respond as we wish they would. They freely choose a path that everyone involved with them wishes they wouldn’t. And that path, oftentimes, leads to failure. Which is something of a problem in an ‘All Must Have Prizes’ culture, where failure and failing is neither a part of the development process nor a fact to be mournfully expected as the inevitable outcome of bad choices, even if never passively accepted. Yet with the cultural and political failure to acknowledge this, teachers and school management are under constant pressure to show that they are not culpable in the failure of the student. And since any failure, by the terms of the game, is itself evidence of culpability, this means teachers are under constant pressure to avoid all failure whatever. At which point that murky landscape of educational ethics comes into view, with exhausted and anxious teachers straying over the once clear demarcation lines, in the process creating a culture that absolves students from real responsibility (and even, sometimes, effort) in their own learning and achievement. In short, the game has shifted disastrously: if a student does not achieve their grades or predicted levels of progress, then primary responsibility for this lies not with student but with teacher. Michael Gove, for all his disdain of those Guardianistas who place the influence of external factors over the demand for personal responsibility, is nonetheless guilty of the very same. Superficially, of course, this aversion to failure is clearly A Good Thing. But there is another side to the coin. If a student does not take responsibility for failures, then from where shall come motivation for improvement? Or to turn it on its head, if a student does not take deserved credit for success, then from where shall come the realisation that from hard work and commitment comes the thrill of achievement? And again, the question must be put – why would teachers risk their very careers and succumb to the temptation of ‘cheating’? As unpopular as it is to say it, there is a meritocratic and even spiritual value to failure, even if we have abolished it from our classrooms. Not in the existential sense, of course, but certainly in the developmental sense – to cultivate in the individual the recognition that success comes with hard work not tantrums, that achievement is the end point of a gruelling process not the contractual outcome of mere attendance, that bad choices lead to bad outcomes and the art of living well is learning to discriminate between good and bad choices.